Home / Camping World / Magazines / NASCAR Home Tracks / Nationwide / ROAR! / Sprint Cup / ROAR! Season Preview Edition Now Available – Free! ROAR! is back for more in 2014. 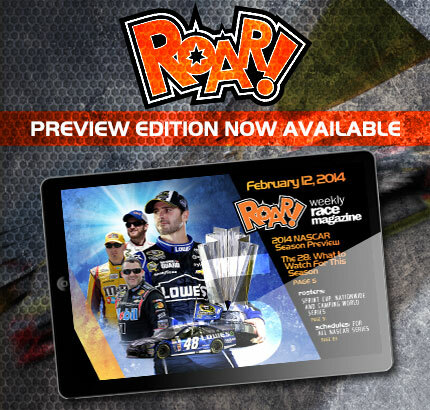 ROAR’s first digital issue for 2014 is now available. Click here to view the latest issue for free! Titled the SEASON PREVIEW EDITION, Volume 2, Issue 1 of ROAR! includes a comprehensive preview of the 2014, captured by our exclusive feature: “The 28. What to Watch for in 2014”. In addition ROAR! provides readers with a comprehensive rundown of the Chase for the Sprint Cup rules changes, plus rosters, schedules and driver profiles for the three major touring series.